Keeping everyone onboard, while offshore, is a priority even on a catamaran - particularly at the bow. ​Manu Kea has invented a Patent-Pending system that attaches a Custom Jackline to the crossbeam (or other secure feature/anchor point) near the centerline of the vessel allowing easier access to the mast and foredeck while keeping the crew physically attached to the boat. Step 1: Determine the desired routing configuration of the webbing for your boat. See instructions below. Step 2: Determine the overall length of webbing needed, based on Step 1. above. See instructions below. Step 3: Order the exact amount of webbing required (in inches) in the Webbing Item below. Step 4: Order a Jackline Assembly Item for each jackline to be fabricated. Boats come in a multitude of sizes, designs and layouts. For this reason many captains need a safety jackline that is reflective of their working areas on deck. Our design allows you to customize the layout for the specificity of your deck area. 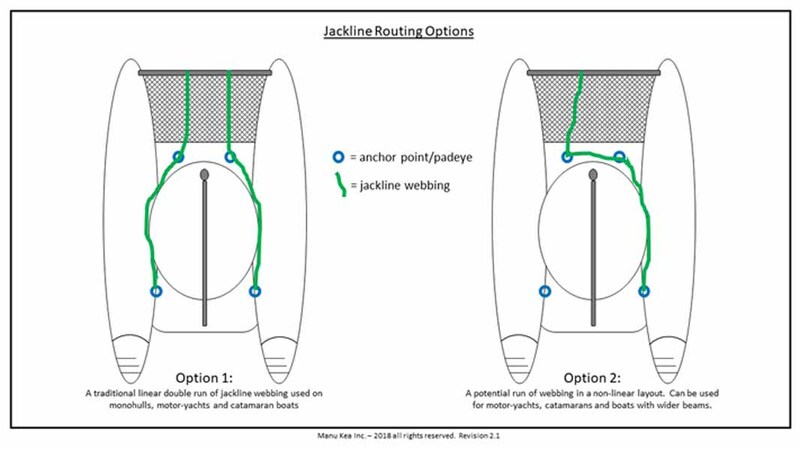 Modern boats often need something more than a traditional linear jacklines that run fore/aft along the deck of a boat. In order to give you an idea of potential routing configurations, see our example ROUTING DIAGRAM here. This is the most important step in the ordering process. As it is not possible for Manu Kea to measure your webbing length required, it is the customer’s responsibility to accurately make the measurement. We have created a visual guide to assist in this process, click VISUAL GUIDE to see this document. Add the required length (in inches) of the webbing measured in Step 2 above to your shopping cart, by clicking on the Webbing Item below. You will receive a continuous length of high-strength polyester webbing with a 2-inch loop sewn into each end. The overall length of the finished webbing (to include the end loops) will be the length measured. Note 1: our fabrication tolerances are -0/+2 inches. This means that your webbing will never be shorter than the length measured, but may be between 0 to 2-inches longer than measured, due to the sewing fabrication process. Note 2: if ordering more than one jackline, provide the total length of webbing needed. When finalizing the order add a comment as to how long each jackline should be. If there is any doubt, we will contact you to reconfirm the order prior to the start of fabrication. For each jackline desired order one (1) Jackline Assembly Item, by clicking on the link below. This item covers the manufacturing costs and consists of all necessary components and documentation. A very robust safety system that installs quickly and easily. The only custom jackline that is removable, just as easy as installation. This facilitates proper cleaning and limits long-term UV damage to the webbing. A safety system that provides a customized solution for secure access to the foredeck, forward lockers, mast, etc. during periods of rough weather. Webbing is a 1-inch wide, polyester with an edge guard to prevent onset of abrasion and chafe. The webbing is rated at 9,800-lb. minimum breaking strength. Wichard 15/16-inch Stainless Steel Allen Head D Shackle made of 316L stainless steel with a breaking load of 12,100-lb. Note: the recessed Allen head shackle pin requires a 6-mm hex key (not included). Padded chafe protection cover is made of Sunbrella marine grade fabric in gray with 1-inch black polyester hook and loop closure material stitched with PTFE thread around a closed-cell foam pad. Each jackline comes complete ready to use. And comes with a Certificate of Manufacture, Installation and Use & Care Instructions. Webbing is available in charcoal or silver colors. Both are very contrasting colors for decks of boats, thus making the webbing easy to see. Note: This is a custom order. We cut and fabricate this product to length for our valued customers. Once cut, there are no refunds. Please see our Store Policies for more information and please measure several times to ensure an accurate fit. Call us if you have any questions or concerns.